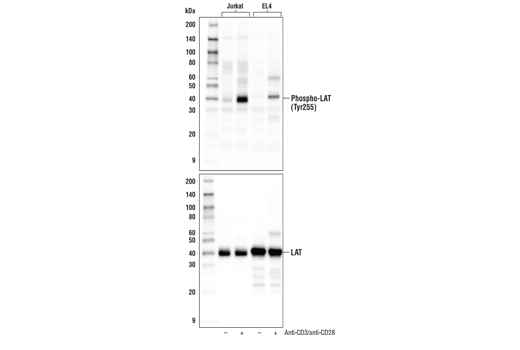 Western blot analysis of extracts from serum-starved Jurkat and EL4 cells, treated with isotype control (-) or treated with cross-linked anti-CD3 plus anti-CD28 (+; 10 ug/mL each, 5 min), using Phospho-LAT (Tyr255) Antibody (upper) and LAT Antibody #9166 (lower). Western blot analysis of extracts from serum-starved Jurkat cells, treated with isotype control (-) or with cross-linked anti-CD3 plus anti-CD28 (+; 10 ug/mL each, 5 min), using Phospho-LAT (Tyr255) Antibody. 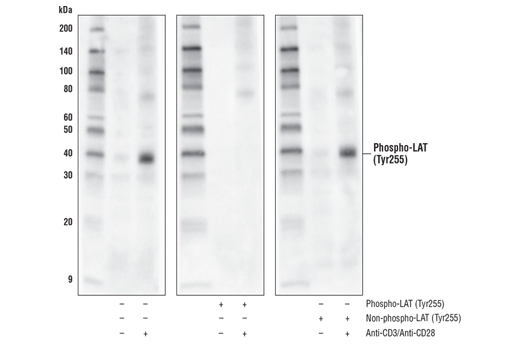 The phospho-specificity of the antibody was verified by pre-incubating the antibody with no peptide (left), LAT (Tyr255) phosphopeptide (center), and LAT (Tyr255) non-phosphopeptide (right). Immunoprecipitation of phospho-LAT (Tyr255) from Jurkat cell extracts that were serum-starved and cross-linked with anti-CD3 plus anti-CD28 (10 ug/mL each, 5 min). Lane 1 is 10% input, lane 2 is Normal Rabbit IgG #2729, and lane 3 is Phospho-LAT (Tyr255) Antibody. Western blot analysis was performed using Phospho-LAT (Tyr255) Antibody. Mouse Anti-Rabbit IgG (Conformation Specific) (L27A9) mAb (HRP Conjugate) #5127 was used for detection to avoid cross-reactivity with IgG. 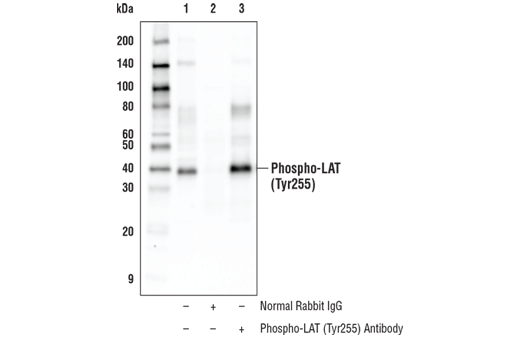 Phospho-LAT (Tyr255) Antibody recognizes endogenous levels of LAT protein only when phosphorylated at Tyr255. Polyclonal antibodies are produced by immunizing animals with a synthetic phosphopeptide corresponding to residues surrounding Tyr255 of human LAT protein, isoform 1. Antibodies are purified by protein A and peptide affinity chromatography. LAT, a transmembrane adaptor protein expressed in T, NK and mast cells, is an important mediator for T cell receptor (TCR) signaling (1). Upon TCR engagement, activated Zap-70 phosphorylates LAT at multiple conserved tyrosine residues within SH2 binding motifs, exposing these motifs as the docking sites for downstream signaling targets (2,3). The phosphorylation of LAT at Tyr171 and Tyr191 enables the binding of Grb2, Gads/SLP-76, PLCγ1 and PI3 kinase through their SH2 domain and translocates them to the membrane. This process eventually leads to activation of the corresponding signaling pathways (1-4). Research studies have shown that LAT is also phosphorylated at Tyr225 by ZAP-70 and Syk following activation of the TCR, which facilitates its binding to Grb2 and Vav and subsequent downstream activation of ERK (5-7). Wonerow, P. and Watson, S.P. (2001) Oncogene 20, 6273-83. Zhang, W. et al. (1998) Cell 92, 83-92. Paz, P.E. et al. (2001) Biochem J 356, 461-71. Zhang, W. et al. (2000) J Biol Chem 275, 23355-61. Lin, J. and Weiss, A. (2001) J Biol Chem 276, 29588-95.